As Dirty Harry would say, at some point the bunnies have to ask not if the dice are loaded, but if the 44 Magnum is. and has now hit the New York Times front page in an article by Justin Gillis, In Weather Chaos, a Case for Global Warming, no question marks and no quotes from the usual denialists. It looks like Stephen Schneider is having a good day. In Eli's little corner of cyberspace this is a basic question, because if the cost of emissions is being paid in lives and fortune NOW, some people, not that Eli would ever care to point an ear, are exposed as having championed dangerous and immoral policies of delay and little to no action. The Bunny notes with interest that a certain occupant of Andy Revkin's Rolladex is not consulted for this article. It must be a great thing for Jim Prall Bill Anderegg, and Jacob Harold that their recent paper is having such a strong effect. It feels to me, too, like I was first to say this publicly. I wonder if I really did manage to kick off the public conversation. I am pleased if I did. This one really is different. Explaining why is going to be tricky, but I guess if the world understands that this event has a lot of scientists startled and scared, that's better than if they didn't know. Rob Carver @ Weather Underground. Stu Ostro at The Weather Channel. I should say that to whatever extent I had a hand in it, Brad Johnson did too. I think that in terms of very public first movers, Michael Tobis was right in there (and, as he says, Brad Johnson too), but loads of others are in there right after him now, which is great. It takes one person to stand up and take that risk and say what needs to be said, and it takes a wave of others to follow in their wake. MT has given courage to others to say their own thing on this. I wonder if we should start to rank years by the costs of the "natural" disasters ? Should 2010 be a "3 Katrina year" ? Are the Climate Damages in 2010 mounting up to be as expensive (in all senses) as three times Hurricane Katrina ? Same question for the Pakistan floods? I wonder if we should start to rank years by the costs of the "natural" disasters ? Years like this need to be entered into the ledger Tol implies must exist when he mentions balancing costs of mitigation versus other expenditures. Is this how "adaptation" and "transition" will manifest itself? It's time to begin keeping track. We (sorry, some company included on the first point) might conceivably lose the war in Afghanistan as well as see Pakistan's weapons fall into the wrong hands thanks to this year's excursions. Do folks decrying mitigation envision such events going into the transition/adaptation column in the books? If not, why not? "Transition" and "adaptation" are wonderful words, similar to "if cabin pressure should change" as opposed to "sudden decompression" but they cover a myriad of uncomfortable details. 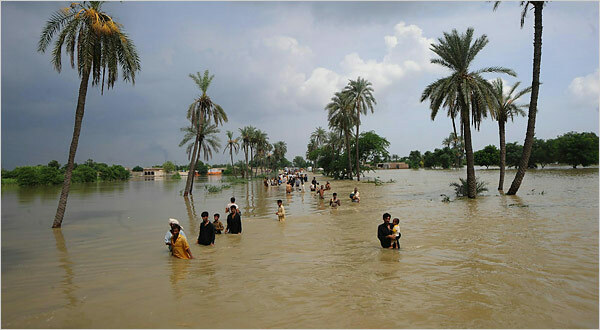 What number of Pakistan's 20,000,000 roofless do we attribute to climate change? 10,000,000? 5,000,000? Surely not zero. Adaptation/transition/muddling-through is going to prove a blank check attached to GDP, a credit card with an open limit, no clear way to pay and no clear definition of where expenditures will stop. I would say the cost in lives and human misery from the failure of government in both of these disasters far exceeds the impact of anthropogenic climate change. @Carrick, in situations like this the toll of suffering can't be attributed to one or the other, rather it's a multiplication of the impact off the disaster by the adequacy or otherwise of the response. Dangerous bus to ride. there have been heat waves before. There will be cold snaps in the future (for Watts to make photos from). In the end, the trend is your friend. And we have much MORE information from looking at overall temp changes, not just extrema. P.s. You still owe me a heat capacity answer in Deltoid from years ago, bunny. The failure of government? I realise that some of the effects of fire in Russia would have been lessened with better infrastructure (and perhaps the kind of trained expert volunteers we have in Australia) but the Pakistan and China floods are altogether different. Can we name a single government anywhere in the world that could have done better? The USA's experience with Katrina tells us of at least one that couldn't. And the tsunami tells us of a few others. Dirty King Coal, I say. One other aspect that guvmints can't control that occurs in cases of large-area fires, such as the ones raging in Russia at the mo, is the propensity of the mentally deranged to wriggle out from whence they came to act out their pyromaniacal fantasies in such conditions. Siouxsie and the Banshees had something to say about the effects of temperature and mental derangement in their song "92 degrees" from the aptly entitled album Tinderbox that might be considered apposite... by me anyway. Where's that CD? Very typical of their news content. Useful garbage for useful idiots. A bungled job in my opinion. A sort of attempt at giving the climate populists some bones, maybe. July 2010 in Moscow went 4 standard deviations above the norm. NOAA calls it 'intrinsic to the natural variability of summer climate in this region'. That it is exactly NOT. "A high index value for blocking days is not a necessary condition for high July surface temperature over western Russia---the warm summers of 1981, 1999, 2001, and 2002 did not experience an unusual number of blocking days." Why not add the NOAA? "The natural process of atmospheric blocking, and the climate impacts induced by such blocking, are the principal cause for this heat wave. It is not known whether, or to what exent, greenhouse gas emissions may affect the frequency or intensity of blocking during summer. It is important to note that observations reveal no trend in a daily frequency of July blocking over the period since 1948, nor is there an appreciable trend in the absolute values of upper tropospheric summertime heights over western Russia for the period since 1900. The indications are that the current blocking event is intrinsic to the natural variability of summer climate in this region, a region which has a climatological vulnerability to blocking and associated heat waves (e.g., 1960, 1972, 1988). " Seems a little more reasoned that Gavin's "gut feel", a hyperventilating journalist and various proven politically motivated anonymous scientist-activist bloggers. It is very well understood that atmospheric blocking results in unusually warm conditions, but it doe snot explain everything. And the heat wave of 2010 in Russia was associated with a significant, but not unprecedented since 1948 (period for which we have reliable reanalysis data), blocking event over the area of interest. Yet, despite previous Julys having more significant blocking events (e.g., July 1972) those blocking events did not produce the same degree of warming (1976 anomaly was ~+ 2.7 C) as in 2010 (~+4 C) . And that is the key point here, and the same holds true for the European heat wave of August 2003. And as noted by RR Kampen, blocking does not explain the anomalous warmth observed in 1981, 1999, 2001, and 2002.